According to the Constitution, Honorary Fellow may be elected each year from those who, by reason of their special services either to the Institution, to engineering generally, or by virtue of their occupying distinguished positions in science or industry, merit such recognition. 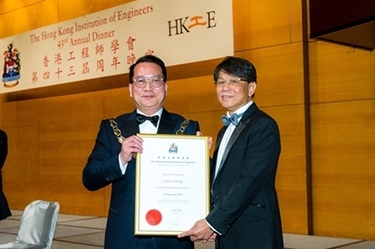 This year, Ir Peter Y Wong received the honour of the HKIE Honorary Fellow at the Annual Dinner. Ir Peter Y Wong joined the HKIE as a Member in 1984 and became a Fellow in 1991. He has been a Council Member and served on Executive meeting held monthly on a Saturday morning for 22 years, and 12 years respectively. Ir Wong has also over the years held different official and ex-official positions in the Institution. In addition, he represented the Institution on many external committees, commissions and taskforces, and is currently chairing ten Institution taskforces. He also participated in the production of two publications for the Institution. He is currently Chairman of the Accreditation Board and was the President of the Institution for Session 2008/2009. Outside of the Institution, Ir Wong was Chairman of the Training Committee of the Institution of Electrical Engineers. The Committee was responsible for overseeing the training programmes conducted in Hong Kong and ensuring that they fulfilled UK criteria. Ir Wong was one of the five members of the CIBSE's panel for several years before the CIBSE was reinstated into the Hong Kong Branch in 1994. He is now the first President of the CIBSE from Hong Kong. Ir Wong has worked with Guangdong Provincial Association for Science and Technology on selected projects since 1993. He was also invited to visit the new headquarters of the China Association for Science and Technology (CAST) in 1995, and has since then maintained a long-time association with CAST. On the industrial front, Ir Wong was instrumental in shaping the constitution of the Hong Kong Electrical Contractors' Association Limited. He was the Association's Vice Chairman for about ten years. He was also the President of Hong Kong & Kowloon Electric Trade Association between 1984 and 1987. Ir Wong has participated in different government committees including those organised by the Labour Department and the Vocational Training Council (VTC) since the mid-1970s. He was later tasked with charting the Qualifications Framework for electrical and mechanical trades across ten related disciplines. The task was the first major cross-disciplinary feat taken up by the Education Bureau. He submitted the first batch of training materials to the CITA and established a venture sponsorship for the VTC's participation in an international skills competition. In the international arena, Ir Wong has participated in many conferences, focus groups and forums. He has travelled extensively to training facilities and organisations, trade and professional associations, governmental and quasi brethren in policy. He introduced the British Standards, equivalent to ISO 9000, to the Housing Authority. The introduction made the Authority the first governmental organisation in Hong Kong to stipulate compliance with the Standards on projects. He commented on the original drafts of the amended Electricity Ordinance before it went public for consultation. He went on to read two law degrees and developed a habit of airing opposite views, whether he agreed to the views or not, in a bid to stimulate debate in meetings.